Robert Lighthizer, U.S. trade representative, speaks to Chrystia Freeland, minister of foreign affairs, after opening statements during the first round of NAFTA renegotiations in Washington, D.C., on Aug. 16, 2017. 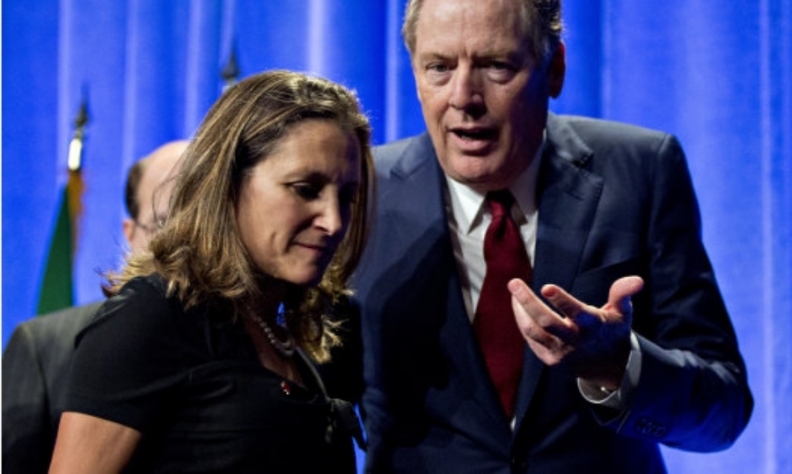 OTTAWA/WASHINGTON — Foreign Affairs Minister Chrystia Freeland ended trade talks with U.S. trade czar Robert Lighthizer a day early with the threat of U.S. tariffs on imports of steel and aluminum and election deadlines still hovering over the renegotiation of the North American Free Trade Agreement. Freeland was back in Ottawa Wednesday, a day after a lengthy meeting in Washington. She said Canada will “respond appropriately” to any U.S. steel and aluminum tariffs, with a temporary exemption set to expire at the end of the week. Freeland insisted the steel issue remains separate from the renegotiation of NAFTA, a deal that Trump has repeatedly blasted and threatened to rip up. "Canada has said from the outset, this is in our view entirely separate from the NAFTA negotiation," she said after her two-hour, face-to-face meeting inside the office of the U.S. Trade Representative, the site of intensive NAFTA talks over the last several weeks. American trade analysts say there's an obvious connection, but Freeland may be downplaying it in an attempt to bargain effectively. "Everything in Trump world is linked, ultimately," Eric Miller of the Rideau Potomac Strategy Group, said in an interview Tuesday. Meanwhile, Prime Minister Justin Trudeau said he pushed for an exemption on Canadian steel and aluminum imports to the United States during his phone call this week with U.S. Vice President Mike Pence. The prime minister said the government is pushing the United States on multiple economic fronts, including getting a deal on a renegotiated NAFTA. Using a national-security clause in U.S. trade law, President Donald Trump is threatening to slap potentially crippling steel and aluminium tariffs on Canada, Mexico and other countries when their exemptions are due to expire Friday. Pence "seemed to understand very clearly that national-security issues don't really apply when you talk about steel or aluminum from Canada," Trudeau said of his conversation. "We're continuing to work, highlighting that it would be not great for Canadian workers and Canadian industry, obviously, but it also would be difficult for American workers, American jobs and American consumers, who will pay more for various products." That is on top of intense effort by Canada, the United States and Mexico to get a deal on a renegotiated NAFTA in time for the current iteration of the U.S. Congress, and ahead of what's expected to be a turning-point election in Mexico on July 1. Freeland pushed the steel and NAFTA issues during her meeting Tuesday in Washington with Lighthizer. "Canada considers it frankly absurd that we would in any way be considered a national security threat to the United States," she said of the tariff threat, which comes under Sec. 232 of the U.S. Trade Expansion Act. "I would like to absolutely assure Canadians, particularly those that work in the steel and aluminum industries, that the government is absolutely prepared to and will defend Canadian industries and Canadian jobs. We will respond appropriately." Freeland left Washington empty-handed early Wednesday, while Lighthizer and Commerce Secretary Wilbur Ross were off to Paris to talk tariffs with nervous European Union counterparts. On NAFTA, she said the efforts continue and that the government remains optimistic that a deal is within reach. "We are very intensely engaged," Freeland said. "Canada has rolled up its sleeves and we think a win-win-win outcome ... is absolutely possible for all three countries." Mexico was not represented at Tuesday's meeting in Washington, but that country is headed to the polls in July. Trudeau has also been talking by phone with Trump and Mexican President Enrique Pena Nieto in recent days, despite dwindling hope of reaching a deal on updating NAFTA. Trudeau telephoned U.S. Vice-President Mike Pence on Tuesday to discuss the continental trade agreement and the potential steel and aluminum tariffs, but the Prime Minister's Office offered no additional details of the call. The rules surrounding autos remain a major NAFTA sticking point, which has left stakeholders and observers alike skeptical that Freeland will be able to accomplish anything substantial during her visit. Freeland said that was a major topic of the conversation with Lighthizer, and remains key to cracking a complex negotiation. "There is definitely a path forward and we are making progress," Freeland said. "The intense engagements we had both at the ministerial and official level for the past several weeks is evidence of how hard everyone is working on this."